First I would like to apologize for being a day late with this, massive migraine yesterday meant I pretty much just hit my bed and curled up like a baby when I got home from work. Anyway, this month I read something that was read by a friend a while a ago and I bought but I was reading something else at the time so it just kind of sat on the shelf. Now I am a fan of graphic novels (and comics in general) but I am more of a Marvel fan than a DC fan so there is a possibility this is why it took my so long to read this. 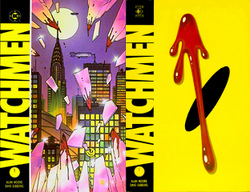 Watchman is written by Alan Moore, the artist is Dave Gibbons and the colorist is John Higgins. It takes place in 1985 in an alternate universe. At first I actually found it a little dark for my tastes (and that's saying something) but once I got into a little further and started seeing the how and why I liked it a lot more. What I like most about it is that there is a how and a why to it, it goes so much deeper than a lot of the stuff that I have read lately. When I was done reading my first that was wow, because just wow and if you've read it I'm sure you understand that feeling. Then I felt that sad feeling you get at then end of a really great experience when you're not sure where to go from there. Check out what everybody else read where the list lives. I liked Watchmen right up until the end. I thought the movie did a much better job with the ending. Oh... Big fan! Alan Moore is the man. I picked up a copy of V for Vendetta just today. Do you have any interest in the prequel comics that were published recently? I've avoided them. I like the fact that The Watchmen offers just a slice of the history. Even though I'm a huge comic fan, I've yet to read Watchmen. Your review makes it sound like a winner, though, so I think I'll have to get my hands on a copy someday! I have heard great things about Watchmen, for sure.